Our break apart series of pipe is perfect for those who travel and do not have car space to fit traditional 8 ft. uprights. The break apart upright turns two shorter sections (each is approximately 4 feet) into a standard 8 ft. upright in just seconds! Easy to set-up, take down, store, and transport. 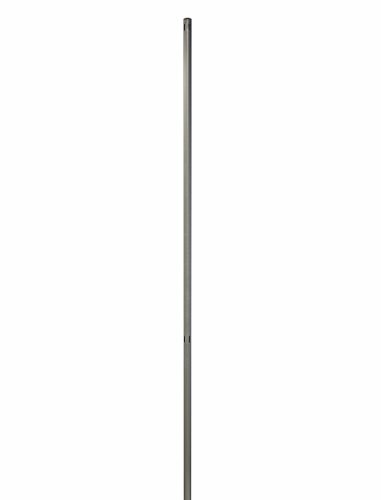 This durable aluminum Slip Fit upright sets the height of your pipe and drape display in our classic silver finish. It is the vertical pipe that is located at each end of a horizontal drape support rod. The height when both pieces are connected is 8 feet (or 96") tall with a 1.5" diameter. The hollow opening in the bottom of the Upright slides over the pin attached to the Slip Fit Base (base and pin sold separately). These Uprights feature 4 slots cut at 90-degree angles at the top and again at the 3 ft. high level (the 3 ft. slots are used if making traditional trade show booths with an 8 ft. tall back wall and 3 ft. tall side walls). These slots act as the entrance point for the hooks in our drape support rods. This gives you the ability to have a variety of display configurations from linear (in line) to L-shaped, T-shaped to booths, and enclosed squares. Most of our products are made and fabricated right here in the USA. If you don't see what you're looking for please visit our store and send us an email. We have an extensive inventory of items in stock and ready to ship. Our sales department has the best people in the business and we would love to hear from you! If you have any questions about this product by P.D.O., contact us by completing and submitting the form below. If you are looking for a specif part number, please include it with your message.